In this mode you can change the composition of the database tree. There are 3 database trees. One each for 1D, 2D and 3D objects. The 1D objects are spectroscopy data, the 2D are images and the 3D are polygon geometries. This mode enable you to manipulate the composition of the 2D database tree by selecting the 2D classes that will be used in the generation of the tree. In the "All Classes" list, you have buttons for the available classes that you can use to compose the database tree. Classes from sliceOmatic basic package have a grey button, while classes imported from the "Additional Modules" section of the Web download pages have a cyan button. For example, the default 2D tree is composed of the Root, Study, Series and Frame classes. When you read an image in the program, it will automatically be inserted in the tree. If the image is part of a new study, then a study class will be created and inserted as a child of the root. If the image is also part of a new series, then a series class will be created and inserted as a child of the study class. And finally a frame class will be created for the image and inserted as a child of the series class. Pressing the "Edit" button will show you the complete tree as it exist in the program's memory. This button will insert a "Study" class in the tree. This class will enable you to branch for each study. This class is usually placed right under the root of the tree. Also see "Study" in The Classes section. This button will insert a "Series" class in the tree. This class will enable you to branch for each series. This class is usually placed right after the study class in the tree. Also see "Series" in The Classes section. This button will insert a "DICOM Tree" class in the tree. You can have multiple instances of this class in the tree. Each instance will be used to discriminate the frames with a different DICOM tag. By default, the first instance will create a branch for each value of the tag (0010,0020) "Patient ID", the second will create branches using the tag (0020,0010) "Study ID", the third will use the tag (0020,0011) "Series Number" and the fourth will use the tag (0020,0013) "Instance Number". 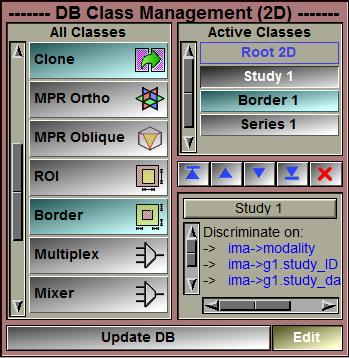 Also see "DICOM Tree" in The Classes section. This class will only work if the files are DICOM. Using the "Study" or "Series" classes at the same time as the "DICOM Tree" class is redundant. This class will insert an "Unsorted" class in the tress. This class is used to re-sort the images. By default, the children are inserted in the order they where read in the program, but they can also be manually re-sorted. Also see "Unsorted" in the class section. Each instance of this class will have 3 children, one is the unmodified images, the other two are new set of frames created by re-slicing the volume in orthogonal directions. Also see "MPR Ortho" in the class section. Each instance of this class will have 2 children, one is the unmodified images, the other is a new set of frames created by re-slicing the volume in an oblique direction. Also see "MPR Oblique" in the class section. Each instance of this class will enable you to select a Region Of Interest in its children frames. Also see "ROI" in the class section. This class only makes sense if all the children of each instance of the class have the same resolution. If you have different image resolutions in your dataset, use a class higher in the tree to place them in different branches ("Group" or "DICOM Tree"). This class enables you to associate different GLI frames to the same TAG images. This is useful if you have different representations of the same slice. For example, some MR protocols produce water and fat images for each slice. Also see "Multiplex" in the class section. This class will insert a "Mixer" class in the tree. This class is used to mix different images (GLI, color or TAG) together. Also see "Mixer" in the class section. This class will apply a convolution filter to all its children. Also see "Convolution Filter" in the class section. You can click on one of the classes of this list to select it. The selected class can be moved or delete with the interface. The "root" and "Frame" classes are always present in the tree and cannot be moved or removed. These buttons are used to change the order of the classes in the tree. The selected class from the "Active Classes" list can be moved to the top (just after the root class), up one level, down one level or to the bottom (just before the frame class). Pressing this button will delete the selected class from the "Active Classes" list. This window displays the information about the selected class in the "Active Class" list. The database tree is recomputed using the classes defined in the "Active Classes" list. The "Edit" button open a class edition window. In this window you can see the complete class tree as it stand in the program's memory. You can remove classes and change their connections. Changing classes connections can be problematic in some cases. For example, changing the children of the MPR classes can have unpredictable consequences. Make sure you have a good idea of what you are doing when you manipulate the connections! Pressing the "Update DB" option will re-generate the database based on the "Active Classes" list. All changes done in the "Edit" window will be lost. In this window you can see the complete class database tree as it is in the program memory. From this window you can remove classes from the tree. Pressing the "Delete" key while the cursor is over a class will delete that class instance from the tree. The children of that class (if there are any) will automatically be connected to the parent of the deleted class. You can also detach and re-attach classes by selecting their "in" circles (the one on the left side of the class box) and dragging it to the "out" circle (on the right side) of another class. The re-attach children will be added to the end of the list of current children if the class already had children. So this technique can also be used to re-sort the children of a class. Clicking on the "out" circle of a class will select the "in" circle of all the children of the class. There is no display area interaction specific to this mode. There is no keyboard interface specific to this mode. There are no command lines specific to this mode.